Aaron Anderson uses both simple and sophisticated lighting setups, and his Tamron 35mm and 85mm primes, to highlight the strength and grace of his subjects. When Aaron Anderson is commissioned to photograph professional athletes, what's paramount to his process is showing a side of them that perhaps hasn't been shown before. 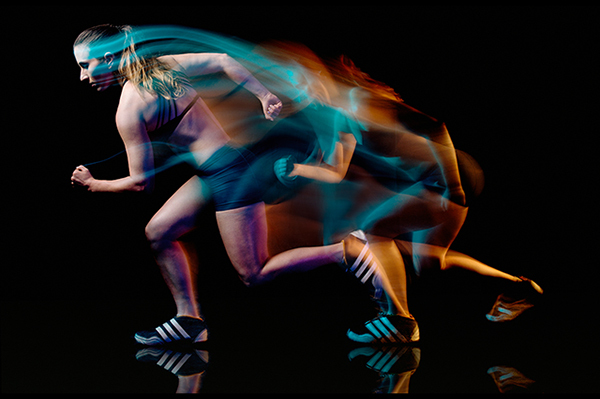 That's especially the case with female athletes, who boast a mix of power, determination, and femininity—all facets Aaron strives to depict in his photos. "These athletes are often tired of putting on a polo shirt and having their picture taken against a white background while they stand there and smile," he says. "It doesn't really show the world how they feel about themselves, how they feel when they're competing, or the strength it takes to train the way they do." 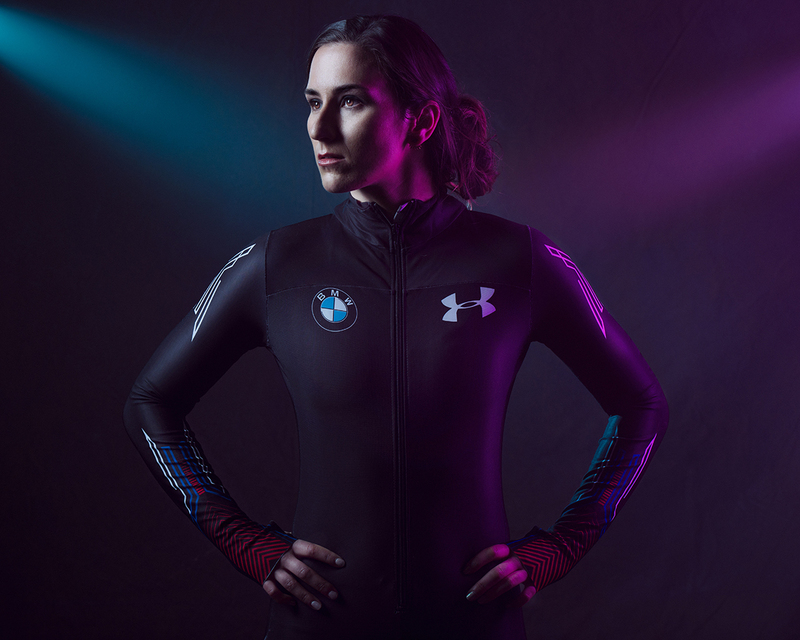 For a recent behind-the-scenes video and photo shoot with Team USA skeleton racer Veronica Day (@veriosa on Instagram), as well as a session with model Grace Peters, Aaron put two Tamron prime lenses through their paces: the SP 35mm F/1.8 VC and SP 85mm F/1.8 VC. "We used the 35mm as our main lens while shooting the video with Veronica and during the photo session with Grace," he says. "It has such a cool cinematic vibe to it, even before I set the lighting up; then, once the lighting came together, that lens proved even more awesome. The 85mm was our main lens for much of the up-close work with Veronica, and it proved to be a stellar portrait lens." For his shoots with Veronica, Aaron wanted to emphasize the athleticism needed to do what she does: heading down a skeleton course of rock-hard ice on her stomach, face-first, at speeds of up to 80 miles per hour. "Being a skeleton pilot isn't really in the limelight that much, but these athletes are in incredible shape," he says. "I wanted Veronica's photos to show off how ripped she is and how hard she's been working." 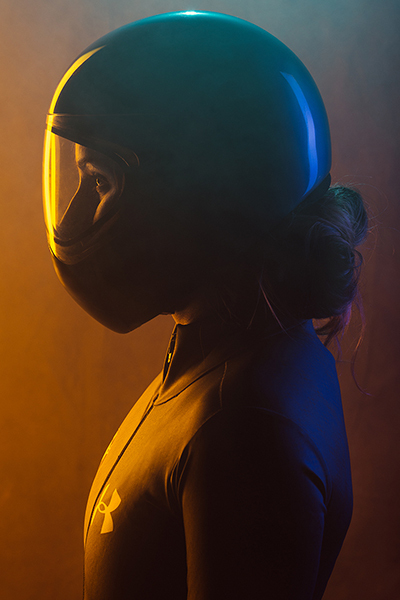 That's why for his first photo of Veronica, Aaron decided to bring together the red, white, and blue flair of her racing suit with a darker, almost superhero feel. "I wanted to focus on that moment when an athlete is getting ready, showing how she might be feeling during her prep time," he explains. Aaron's lighting setup was designed to concentrate on the features that would draw that feeling out. "I wanted to show her distinct jawline and strong neck, for example," he says. "We filled the room with haze and had light coming from behind her on the left from a snoot with a grid and blue gel on it. The light coming in from the right I actually put in during post-production, because I felt I needed it for balance." Aaron continued that superhero-like theme in his photo of Veronica in her skeleton helmet, complete with more colored lights filtering through the haze. "I wanted more of that mysterious beauty, but also to lend a powerful sense of her getting ready for what she's about to do on the course," he says. "A lot of times these athletes are working for years, day in and day out, making very little money, yet they're some of the most incredible athletes you've ever met. What I wanted to show here was that moment right before all that hard work is about to pay off, when she's ready to take on the challenge of everything she's trained for." To once more highlight Veronica's strength and power, Aaron added a motion blur photo into the mix. "Veronica used to be a track athlete, so when she puts on her running outfit, every bit of her is abs and arms and she's completely shredded," he says. "I used long 1-second exposures, and everything was done in-camera. I gave her a countdown, then she made a big running move and landed; the shutter was open for 1 second while she was moving and the modeling lights on my strobes created the blur. I used rear-curtain sync so that the flash would go off at the end of the 1-second exposure; that way she's frozen so you can see her clearly. We had a light on either side of her—one with a blue gel, one with an orange gel for the motion blur—and we had another softbox up above her with a grid that we used for the final flash." For his session with model Grace Peters, Aaron knew he wanted to do a shoot that showed her playing basketball as soon as he saw a photo of her on Instagram shooting hoops. "Grace does a lot of fashion work, but she's also really fit and seemed like she'd be perfect for the sports-themed shoot I had in mind," he says. 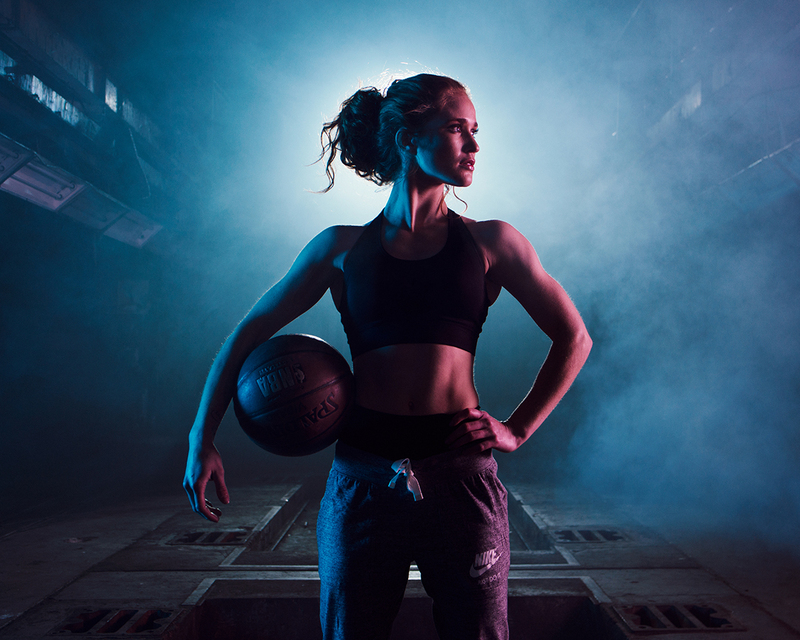 "The concept we storyboarded was that she was an athlete training to be a basketball star, in a remote location she had all to herself." That location turned out to be an abandoned newspaper factory. "Each room in that place had its own unique character," Aaron says. "The bathroom, for example, had huge community sinks, and the locker room, which you see her sitting in in this first photo, had this vintage vibe to it with all of that wood. I assume this is where the workers showered the ink off once they finished printing the newspapers and called it a day." Aaron rearranged the benches that were already in the locker room and filled the room with haze, using three lights to set the scene. "There's a large 53-inch Octobox off to camera right, which offers some nice, soft fill," he says. "Then we had a 7-inch reflector shooting up into the ceiling to make it appear as if light was coming from the top. We also used that snoot again for a soft beam of light on Grace to bring focus back to where it should be in the scene." 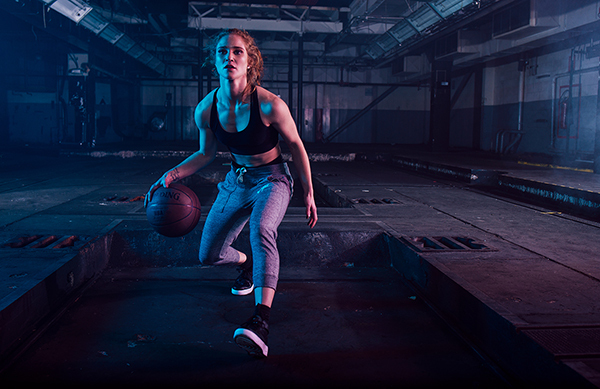 A photo of Grace dribbling the basketball in the empty factory conjures scenes of Rocky Balboa or Demi Moore in G.I. Jane training in the wee hours of the morning and late into the night—exactly the look and feel Aaron was going for. "Where she's standing in this shot is where all the print machines for the newspapers used to be," he says. "The lighting for this photo is a little more complicated. It's a five-light setup, starting with a 53-inch Octobox with a pinkish gel on camera right. On camera left there's a large stripbox with a blue gel. Then, on camera left and camera right, pointing toward the back of the building, I placed two 7-inch reflectors to light up that back area and give the photo some depth. Finally, right behind me is an indirect softbox: a 75-inch Octobox that's really soft, just to give some fill so you can see the details of what's going on with her." For his last photo of Grace, Aaron wanted to convey a final thoughtful moment, where the athlete Grace is portraying is taking the time to psych herself up and boost her inner confidence. "I positioned her on a platform in between the slots where the print machines used to reside, then got down a little lower myself so I could shoot from below and impart that idea of strength," he says. "I used an interesting modifier on her that hooks onto a strobe and turns it into a mini-spotlight, like you'd see in a stage production. I placed that behind her and added a lot of haze. I also had the 53-inch Octobox with a gel on camera right, as well as a large strip with a blue gel on camera left. I used just three lights here because I wanted the photo to go darker in the middle so it was just about her and that one moment in time. Grace did a terrific job embodying the spirit of that moment." To see more of Aaron Anderson's work, go to www.aaronandersonphoto.com.